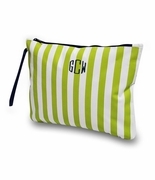 Monogram stripe accessory pouch with bold stripes in teal and white with hot pink piping around the edge. 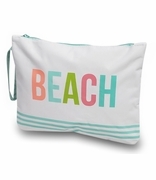 Bring it on vacation, toss it in a tote on the way to work or out the door. Roomy size accessory pouch for beauty and bath items, cosmetics or small travel pouch for tech cords, ID's or small necessities. Partner this accessory pouch with the charming and fun travel weekender item WB-M440SKY. 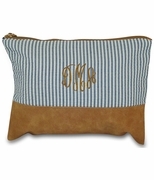 Perfect for embroidery with a three letter monogram, single initial or name. 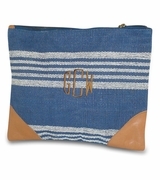 The stripe monogram accessory pouch measures 11"W x 7"H x 2" across bottom.